The Swell Form Graphics Machine (often referred to as a fuser) is a simple, fast and low cost method of creating stunning tactile maps, diagrams, text and graphics. This machine has revolutionized the process of creating tactile images for the visually impaired. Uses Swell Touch paper also called PIAF or Capsule Paper. Using the special Swell Touch paper, simply print onto this paper as you normally would through your standard printer or copy machine (we recommend a laser printer/copier, as it creates finer lines). Once the desired image is onto the Swell Touch paper (or, swell paper, capsule paper, microcapsule paper, flexi paper), run this paper through the Swell Form Graphics Machine. As it goes through this machine, the heat reacts with the black ink (only the black ink, no colors) and causes it to “swell” or puff up, creating the tactile image. 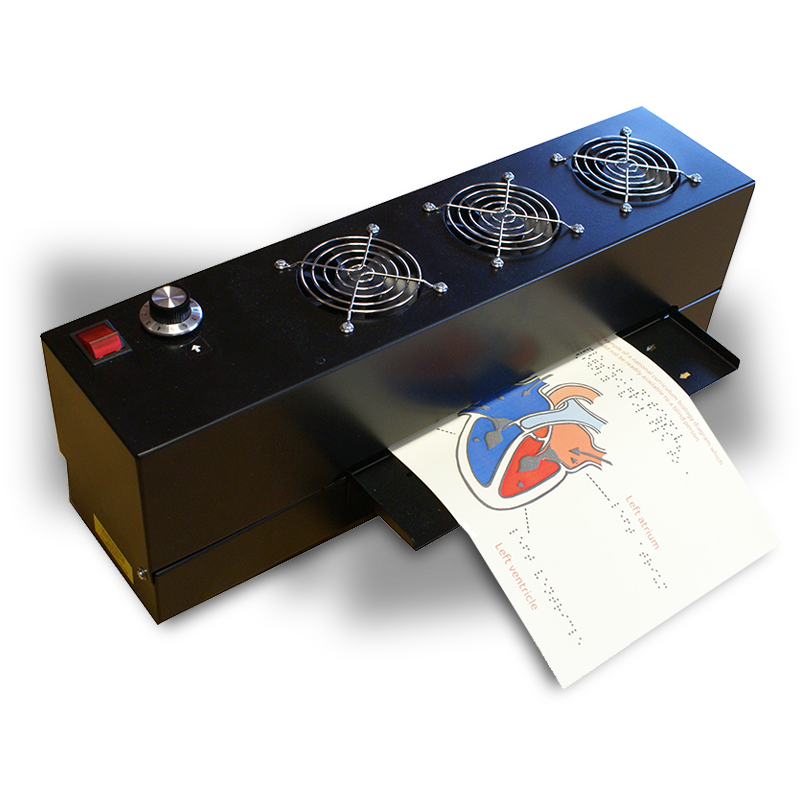 Once the desired image is onto the Swell Touch paper (or, swell paper, capsule paper, microcapsule paper, flexi paper), run this paper through the Swell Form Graphics Machine. As it goes through this machine, the heat reacts with the black ink (only the black ink, no colors) and causes it to “swell” or puff up, creating the tactile image. The rest of the paper and any colors, will remain flat. Instead of using a printer or copier, a user can also draw directly onto this paper using a special black marker. The process is the exact same – as soon as it goes through the machine and reacts with the heat, the black ink will “swell”. Unique to this machine is it auto start and stop and consistent superb quality after each use. As soon as it’s turned on, it’s ready to go. There is no waiting time or warm-up period. The machine and the accompanying paper are safe, user-friendly and non-hazardous. Our Swell Touch paper can also be used with other tactile image enhancers available.